My inspirations come from my images of water, sky, flora, and architectural details. 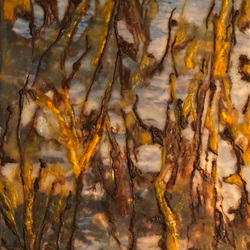 I deconstruct images and use them in layers of encaustic medium to create pieces of visual and textural depth. These details also influence my jewelry creations of wire and stone. DIRECTIONS: Driving Instructions: From s.: From Hwy 20, turn right on Miller Rd. At stop sign, turn right onto Balda Rd. Turn left onto Bluewater Ln at bottom of hill. From n. From Hwy 20, turn left on Miller Rd. At stop sign, turn right onto Balda Rd. Turn left onto Bluewater Ln at bottom of hill.